This is a guest post by Jeff Rose. Jeff Rose is an Illinois Certified Financial Planner(TM) and co-founder of Alliance Investment Planning Group. 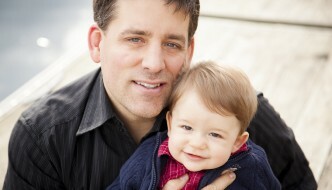 He is also the author of Good Financial Cents, a financial planning and investment blog. You can also learn more about Jeff at his website Jeff Rose Financial. Okay, quick disclaimer: I am a financial planner, not a cook. I’m the typical guy that can throw a burger or chicken breast on the grill and work some magic. In the kitchen, I can make a mean peanut butter and jelly but that’s about it. See, I wasn’t always this bad. I used to be a decent cook in college, but since marrying my wonderful wife; she as taken on the role of the master chef. So getting out of practice, I kind of lost my touch. That is until until I stumbled Jeremy’s steak chili recipe. The whole steak chili cooking experience rekindled some of my enthusiasm in the kitchen. For those that are the clueless in the kitchen, that recipe is awesome. The pictures and step by step process are perfect for the typical clueless person in the kitchen. Yeah, that’s me. In the spirit of simplicity, I wanted to offer a recipe that was 1. Easy 2. Good and 3. Easy. Face it. 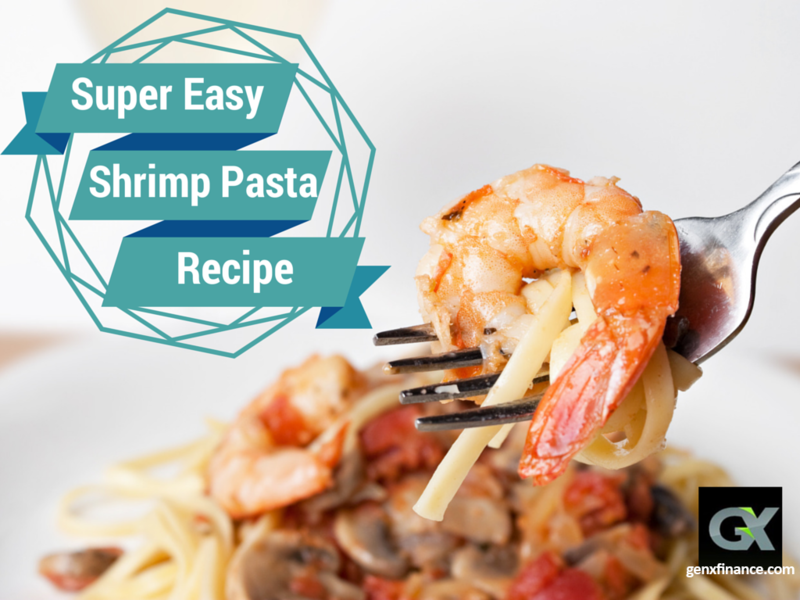 Easier the better and this is the easiest shrimp pasta recipe that you’ll ever make. I guarantee it! How can I guarantee it? Because I made it, of course. First, let’s take a sneak peak of the finished product. Hungry yet? We already had most of the above mentioned ingredients in our kitchen. If you have to buy some of the items mentioned, rest assured that they will last much longer that just this meal. Overall, I can’t see you spending more than $15 on the whole list with the exception of buying a large container of olive oil. Now that we’ve seen the ingredients, let’s look at preparation. To defrost the shrimp, you will need to just run them under cold water for a bit. After that, you’ll add the butter, olive oil, garlic and seasonings to a skillet on medium heat. Then just add the shrimp into the mix. It will look like this this below. How much of the ingredients do you add? Well, as I mentioned above, I’m a big fan of olive oil and garlic. So more the merrier. While you’re cooking the shrimp, you can be boiling your pasta. To feed 4 people, you will probably only need a half box of pasta. Feel free to cook a bit more, but I’m almost certain you’ll have extra. I didn’t include a picture of the pasta boiling. I hope that isn’t necessary. If it is for you, stop reading now and head straight to your local Italian restaurant, because you don’t stand a chance. 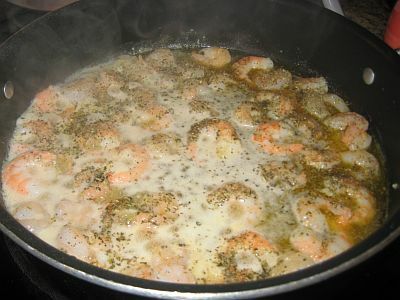 The shrimp will cook for 10-15 minutes, just stirring occasionally. And guess what? That’s it. Seriously, it’s that simple. 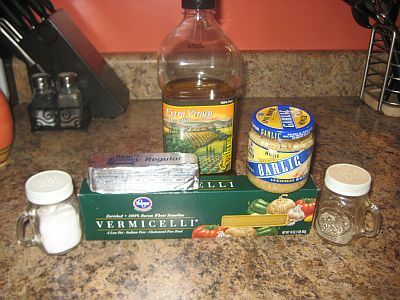 By using the appropriate amount of olive oil and butter, there should be enough that will be the sauce of the pasta. Just scoop and spread over the cooked pasta. The finishing touch is one of my additional favorites — parmesan cheese. Not the powdered stuff that you’ll find on the table at Pizza Hut. I’m talking about the real stuff that has to be refrigerated. Kraft will do. Just sprinkle on and you are ready to eat. For this particular evening, we ate the pasta with a side of green beans. Always good to have a vegetable! Typically, we like to eat this with asparagus that we prepare in a separate skillet. Next time, I’m even considering adding the asparagus with the pasta directly. 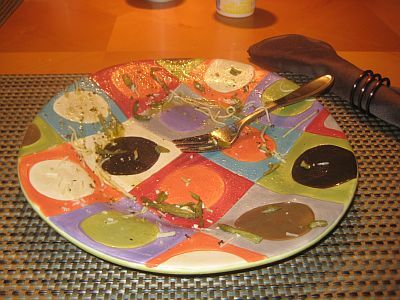 Well, hopefully the pasta was success and your plate looks like mine did below. I have to admit this was after my second serving ;-) Overall, with the bag size of shrimp that we purchased it will make about 4 “man-sized” portions. We almost always have leftovers which is even better! Hope this was helpful. If you like it, let me know. If you don’t, blame Jeremy :) If you added anything or changed up the recipe a bit, share with all. And if this recipe wasn’t enough, be sure to check out Jeremy’s crock pot pulled pork recipe or how to make applesauce. Love to hear some feedback. Enjoy! What if I dont have olive oil? Is there something else I could use? Thank you sooo much for this easy recipe. We have Superbowl leftovers, shrimp and Italian sausage, that I'm gonna use this with when I get done here. What a versitile recipe that I can imagine using over and over again with different pastas, meats and veggies, not to mention jazzing up the sauce. Thanks again. This is one of my kids favorite meals (we eat it on the nights my husband has class, because he's allergic to shrimp) but in our house, we use bow-tie pasta (which my little girls have dubbed 'butterfly' noodles, so the name of the meal: BUTTERFLY SHRIMP was born! Absolutely easy and tasty!! I just made it for my family, and everyone loves it. It's the end of the month, and usually by this time, we are running out of things to make for meals, and I actually had all the ingredients at home to make this. Definitely gonna make it again!! Thanks for the recipe. So, I have made this recipe on several occasions with left over ingredients as a quick meal. I add chicken, asparagus, crushed red pepper flakes, and a squirt of lemon juice to bring out the flavor on top of the ingredients listed above. Even my children love this recipe!!!! Whenever I make pasta, I throw some chopped asparagus or frozen peas into the boiling pasta for the last few minutes. Adds a veggie without any extra pots to wash. I found this in a Google search looking for shrimp and pasta recipes. I'm glad I did. This was easy and VERY tasty...you know you're doing something right when they ask for seconds. Thank you! Recipe was easy and ingredients reasonable. I decided to kick it up a notch and cut up some boneless skinless chicken breast(cubed)and smoke sausage in addition to the shrimp. It was delicious my family loved it. For a side I had Mexicana Corn and fried fish. I agree with some other comments u nreally dont need exact measurements for anything its pretty much up to ur taste buds and season to taste. Thank you for this. Yum. I added white wine. delicious, quick, easy. tossed some fresh chopped tomatoes on the finished product... and just realized I totally forgot to put parmesan cheese on it. gah. I love parmesan cheese, so for me to forget it is a testament to how good this pasta is on its own. Next time I'm personally adding more garlic and wine. So why does the last picture look like the pasta was dumped rather then eaten? I have done this one before and it's always delicious, thanks for showing pictures that was great. Do you have anymore easy recipes that you can share? Very Good I liked it! I used string beans diced tomatos & hotsause in addition, to Jeff's recipe. Also Kraft "Shredded" parmesan is not bad compared to some Italian brands with romano cheese in it from Kraft, its not half bad. I grab some everytime I go to Target. This is an easy tasteful meal. Perfect recipe -- simple & delicious. Even for a person who doesn't cook much & usually requires specific measurements for everything, this recipe was foolproof. Thanks!! You didn't include how much of each thing was supposed to be where. such as olive oil and so on..
ditto on the countertops. LOVE the dishes as well. I am having this for dinner tonight. Thanks for the pictures...always a plus in this VISUAL planet we live on. I suddenly want to go to Italy. Thanks for Sharing!! Deeeeeeeeeeeeelicious and I had all the ingredients in the kitchen, thank you!!!! This was an excellent recipe. 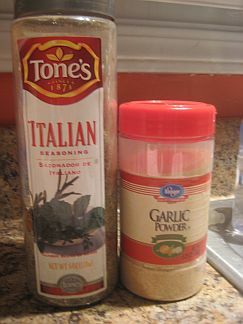 I added seasoned salt, some cream, and a little chicken broth to the sauce and served it over penne pasta.... LOVE IT!!! Tasted Great and a good meal when we are low on money! How much do you put in of each of the ingredients? It's an awesome dish. Next time try adding in some red peppers along with the asparagus. Cooked if for 2 kids and hubby and they loved it!!! Thanks all that have enjoyed! Added to the post above, you'll now see a chicken pasta recipe that I've tried. Be sure to check out that one as well! I do something very similar to this except I start with some sliced zuccinni or squash (or both! )in the pan with a little butter, some olive oil and garlic. Once they have cooked a little I add a can of diced tomatoes and bring to a simmer. Then the defrosted shrimp go in for a few minutes to heat them up. Spoon over pasta (I like angel hair for this) and voila.... meal ready. I think next time I think I might add some wine. This is great in the summer since it's nice and light and not overly heavy like a pasta sauce can be. Hey tom, ya want cheap? A 750 ml bottle of Pacific Peak Chardonnay for only 3 bucks! 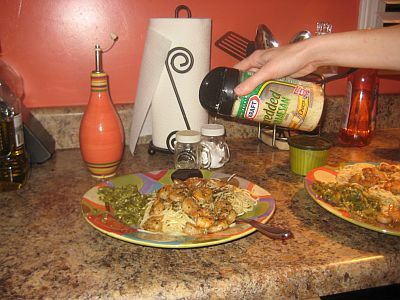 So you could use some of the wine in the reduction and down the rest with the meal and still come out on the cheap. And no, it surprisingly doesn't taste as bad as it costs. Also, if the shrimp curl up like that, you've over cooked them. You were using pre-cooked shrimp, which only needs a few minutes at the most to heat through. Overcooking shrimp can make them chewy and not as tasty as they might have been. Next time, go for raw shrimp. who said that Kraft is real parmesan cheese? That's just as bad as pizza hut..
i agree with brian for the white wine but that wouldn t make it the easiest and cheapest sauce right? But,.... sorry, i have to stop you from parmiggianing the shrimp. Parmiggiano and seafood/fish sauce is a faute de gout. Tenez le vous pour dit. Awesome. Thanks for all the kind comments! 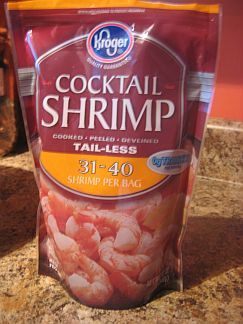 Just an update at Kroger's (midwest grocery store) yesterday, the same bag of shrimp was on sale for $6.99. Picked up two bags for shrimp pasta in the future. @Eves. Thanks for the Digg. Muchas Gracias! @Joe. Great pic! I might experiment in using the garlic cloves next time, too. @Brian Sorry, the wife is not a big wine drinker so it didn't fit. I do like the way you think though! What, no white wine in it? A little bit of cheap Chardonnay before reducing could make this awesome dish even more awesome! 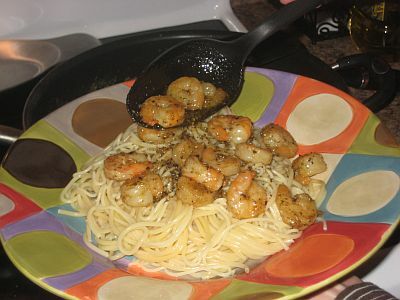 Damn, now you got me hungry for shrimp... gotta make something like this tonight (with the wine, of course). Excellent recipe and even better photos. I think making your own meals is a lot more fun than going out and, as you've shown, cheaper. Thanks for this recipe, it truly does taste as good as it looks. 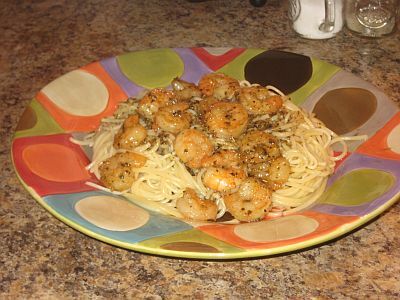 We ended up using 1lb of shrimp, two sticks of butter, 1/2 cup of olive oil, and 5 large cloves of garlic. The rest was seasoned to taste. Great looking pasta. Kind of a shame it got ruined by putting Kraft Parmesan on it instead of fresh. Also, nice countertops. ohhh my god! this looks sooooo goood!!!! I'm freaken hungry looking these pictures. Can't even read the blog! That's some good looking pasta! Simple, easy to make, and I already have most of the ingredients...I like it!